-- Select a Size/Color -- X-Small Small Medium - Out of Stock! Large X Large - Out of Stock! 2X Large - Out of Stock! 3X Large - Out of Stock! 4X Large 5X Large 6X Large - Out of Stock! 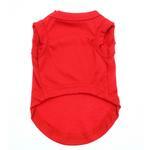 Our Plain Dog Shirt in Red will have your dog looking fabulous in this versatile shirt. Stand out among all the other dogs! 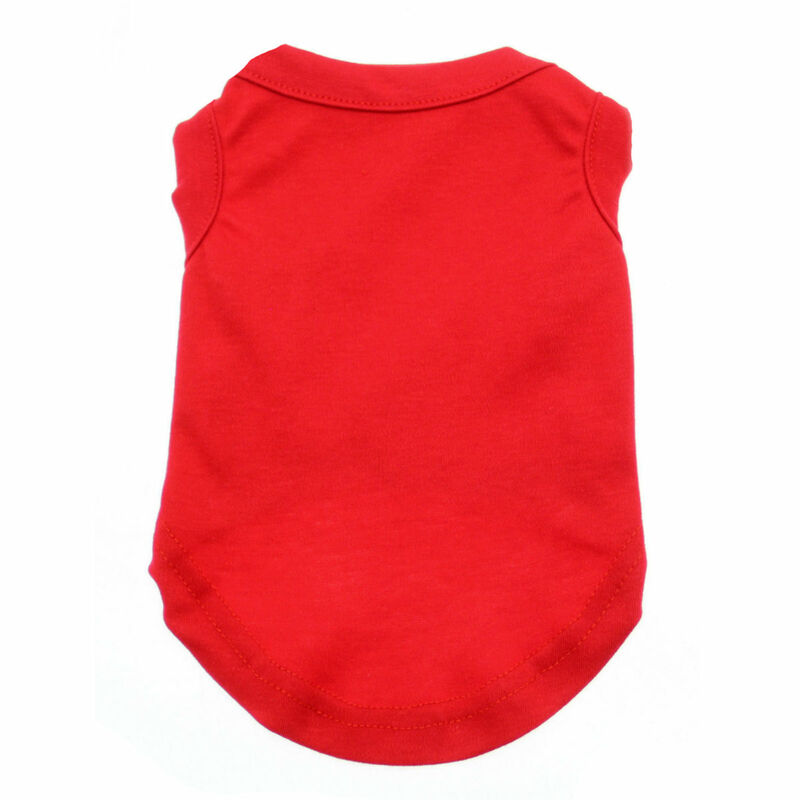 The Plain Dog Shirt in Red is a cool, comfy design for a perfect look year-round. Plus, the lovely hue look makes quite a fashion statement! This red dog shirt is appropriate for Valentine's Day, Christmas and any patriotic event. For even more fun, add iron-on patches, embroidery, or screen printing to commemorate an event or just for cuteness. Plain Dog Shirt - Red Customer Photos - Send us your photo! Meko looked so snazzy in his red t shirt for Christmas. We live in Florida where it is still warm but the evenings chill off. He loves the warmth of the tees. Duffy is adorable in his new red tee! Zorro, an American Hairless Terrier, is enjoying the warm weather, and trying not to get sunburned! These dogs are hairless and need tees to keep from getting cold in the air conditioning, and sunburned outside! I love relaxing in this Red T-Shirt. I can stretch out in this comfortable Red T-Shirt. This Red T-Shirt is perfect. Love it on warmer days. Posted On 03/02/17 by Marie S from Doylestown, PA Yes, Marie S recommends this product! My dog weighs 6 lbs and the small fits like a glove. I think I'll return and order a medium. Great color red. Posted On 02/22/17 by Debra D from , CA Yes, Debra D recommends this product! I have a newfoundland and bought the largest size they had which was a size 6xxlarge. It was way to small. They are not really for giant breeds even though they say they are. Other than that they sent it out very quickly. I love these shirts so much! Posted On 12/19/16 by Tom R from Dallas, TX Yes, Tom R recommends this product! Posted On 08/26/16 by Susan A from Santa Rosa, CA Yes, Susan A recommends this product! Posted On 05/19/16 by Donna F from MADISON, NJ Yes, Donna F recommends this product! Great fit and love the color. Highly recommend! Posted On 02/22/16 by tonia k h from ofallon, MO Yes, tonia k h recommends this product! I bought 3 red plain dog shirts. They are perfect and will buy more. Posted On 10/13/15 by Phyllis W from Philadelphia, PA Yes, Phyllis W recommends this product! Posted On 09/01/15 by Betsy S from , CA Yes, Betsy S recommends this product! This red t-shirt is so soft and fits Suki perfectly. Your products are of a great quality. Thanks Baxter Boo! Posted On 11/12/13 by Melissa C from Rochester, MN Yes, Melissa C recommends this product! I bought 3 of these t-shirts in different colors for my little dog who has almost no fur on her sides. They go great under her sweaters! Posted On 11/09/13 by Donna Lee A from Oak Lawn, IL Yes, Donna Lee A recommends this product! 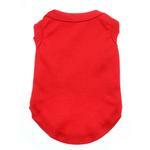 Tomato red shirt, beautiful on dogs! Nice Quality, too! 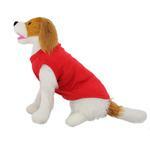 I have been a customer of Baxter Boo for some time now, and have been consistently satisfied with every transaction. The products received have been exactly as presented and shipping is prompt. Excellent customer service as well!